Literary foxes are usually sly tricksters, but debut picture book author-illustrator Esmé Shapiro brings us one that is a people pleaser. Ooko is an expressive little dough ball that mistakes dogs for other foxes and humans for “Debbies” after hearing one human call another by that name. He sets out to make himself more attractive to the Debbies in order to gain the one thing he’s always wanted: a friend. There is a light-as-a-feather absurdity and sweetly batty humour to Ooko’s quest to impress. Written in the first person, the fox’s exclamations of “Voila!” “Easy-peasy,” and “Oh my crickets!” establish him as a loveable and eccentric little bumbler. He is an indefatigable go-getter in the body of an overfed, orange raccoon, juxtaposed against a stylish backdrop. Shapiro’s mixed-media gouache, watercolor, and pencil illustrations are sophisticated and cute. The Debbies wear outrageous patterns, have big hair, and live in a landscape saturated with greenery and gorgeous flowers. The text is short and reads like a funny inner monologue. While it would work as a read-aloud, the gags do depend on decoding some of the busier spreads. And the moral of the story? 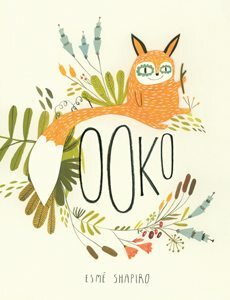 After a (fairly predictable) turn of events where friendship is found under a rock, Ooko says, “But hey, to each their own, right?” There is no subversive risk for readers to wrap their heads around in the ending – just a lovingly dopey fox yearning for a pal. The whole thing may seem to have an overly twee, Etsy aesthetic that is better suited to greeting cards than picture books. Not so. Shapiro is on to something here: a hard-to-define “Ooko-ness,” that is lovely, invigorating, and pure.